Opening my heart and letting these words out. These fears have been a mental challenge for me daily right now but each day I wake up, love on my family, move forward, and continue this journey of hope. I know this is all a part of my journey of loss. The things I never ever anticipated. Sometime last fall, I was having lunch with a friend and our girls. We were discussing how big they are getting and that they’d be off to Kindergarten so soon … just like that. We laughed and joked about school. I admitted how I am not ready and I am scared to put Miss Kaylee on the bus that first time. Admittedly, I’ve done this twice before, it shouldn’t be such a big deal, but she’s my baby. I worry that Kaylee will be scared getting on a school bus by herself. Before I could even fully process what was coming next, just friends talking casually, I heard something along the lines of, “Oh my daughter will be fine she will march right on the bus with her big sister and together they happily walk into school.” I went blank. Numb. Whatever was said after that I don’t even remember because my entire body went numb. Not because I was offended. I wasn’t offended. But because I couldn’t wrap my mind around my reality. And there began my steps through the upcoming year. Kaylee was supposed to be marching on the bus with Nate. 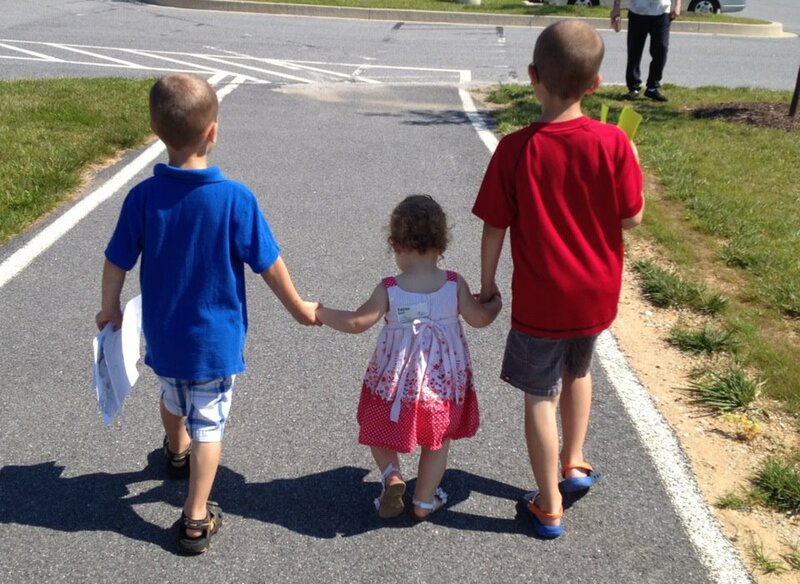 Nate, being the big brother that was going to hold her hand, tell her its okay, and show her the way. He would be in school with her. He would protect her. This just isn’t fair. As fall creeped by, winter set in, and Kaylee’s 5th birthday approached my heart became ever more aware of the year ahead. This was the year I’ve been emotionally dreading for some time now and, now, here I am. I am in it. Kaylee is now 5. She is the same age as we last knew Nate. This year, she will pass Nate’s earthly age. She is his size, she has his foot steps. Sometimes she has his laugh, his quirky faces, and giggles. She is sweet but she has his stubborn side. She makes your work hard for each hug but when you get that hug you feel her forever squeeze. How does a parent wrap their mind around that? How does my youngest child pass her older brother in age? She will grow and mature past the place where we remember him. It’s not the way life was intended for us to live. In this journey of grief we are on… that is a huge mountain to climb. The year ahead brings a lot of fear for me. Deep down, I know that most of that fear is crazy talk – I, honestly, have enough of myself grounded to realize that. But that doesn’t mean it isn’t there. I am afraid of her being 5. I am afraid of her turning 6. I am afraid of missing one second of life with her or Drew. I am afraid of her first bus ride or to see the look on her face when she comes running off the bus excited. I am afraid of Kindergarten. I am afraid of that first day of school. The first week of school. The second week of school. The weeks Nate didn’t get. The time we don’t have. I am afraid to see the year ahead. Each school year is hard for me to process and put Drew back on a bus after summer break, but my baby, Nate’s little sister, the one he was supposed to take to school…. I can’t even wrap my mind around it. I am trying to get this parenting thing right. There is no guide on how to grieving parents should parent grieving children but we are giving it all we have with our arms and hearts wide open. When Drew was in Kindergarten, I had Nate home cuddling with me, and this baby girl of mine in my belly still. I am afraid of the emptiness of the house when Kaylee is off to school as well. This week, while I was in the elementary school, I jokingly told the front office to get ready for me next year that I’ll be that crazy momma who sends her baby off to Kindergarten. You know what I heard back, one of the most comforting yet simple compliments. “Not you… you are a very grounded Momma.” I walked away feeling humbled… because despite how crazy I may feel at times, we are doing this parenting thing okay. Grounded… that is exactly what I want my kids to see. I want them to enjoy and love life and not be confined by the fears that “could” control us all. Each year, since 2013, I have picked a word to help me focus for the year. This year I had struggled with what the word should be. I knew I needed a word to push me through the year ahead. To help me be brave, to help me put one foot in front of the other each day, and a word that would remind me to turn into Christ daily. Then this verse hit me. It hit me like a thump over the head. Literally, as if God tapped me on the shoulder and said hello! Be on guard. Stand firm in the faith. Be strong. And do everything with love. I knew right away what my word needed to be: Steadfast. Steadfast is defined is fixed, firm, and unwavering. I need to be firm in my faith, unwavering in my strength, and abundant in my love. I need to be steadfast. Whether I like it or not, this year will keep moving forward. Kaylee will, undoubtedly, ask more questions about Nate. She will start Kindergarten, she will pass his earthly age, she will outgrow him. We will look at her book of pictures of her and Nate many times over. We will continue to share Nate with her in every way we know how. We will all keep putting one foot in front of the other. The road isn’t easy. It hasn’t been and it won’t be. But with hope, and love, we will not only make it through but we will come out on the other side even stronger in faith. Greatness lies in each of us. Sometimes, you just have to dig deep to find it. ©2019 The Nathan Chris Baker Foundation. All rights reserved.